Smoky, deep, rich, tangy, bright. All of these adjectives define this very famous spread from the Balkans called ajvar. In its most basic form, ajvar is a condiment that is prepared with roasted red peppers and eggplants that are mashed, then simmered for hours to obtain this delicious side dish that is concentrated in flavors. 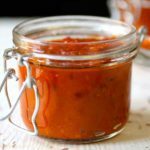 Ajvar can be used as a garnish for grilled meats, be served in a meze platter, or just by itself on a piece of bread with olive oil and garlic. 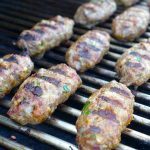 It is often served with ground meat kebabs called cevapi (or cevapcici) and a traditional flat bread called lepinja (or somun). It can be sweet (traditional), spicy (most common), or very hot. Making ajvar is a ritual that is closely associated to the fall season in the Balkans. Indeed, the peak harvest time for red peppers starts around September. Families around the region roast batches of peppers and eggplant to make plenty of ajvar and preserve it for the entire winter season. 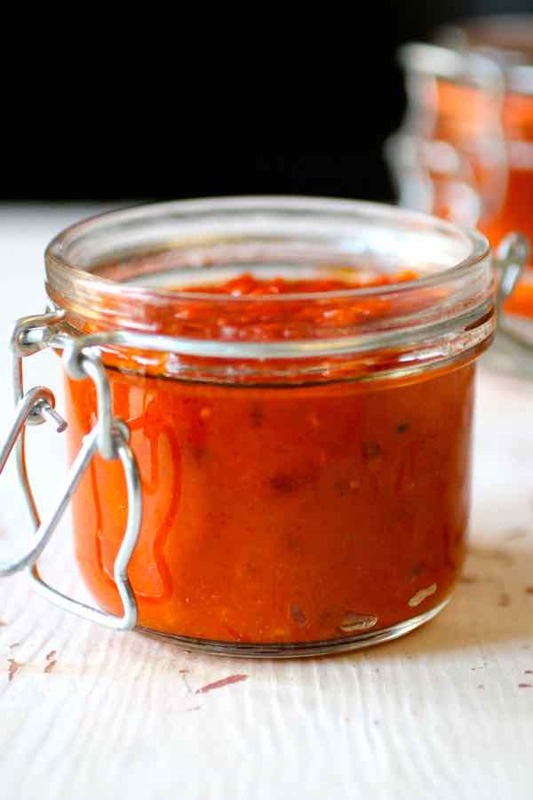 Ajvar is actually considered one of the zimnica (winter foods). These include recipes like pickled chili peppers, pickled tomatoes, and a number of other seasonal foods that can be canned in a jar. 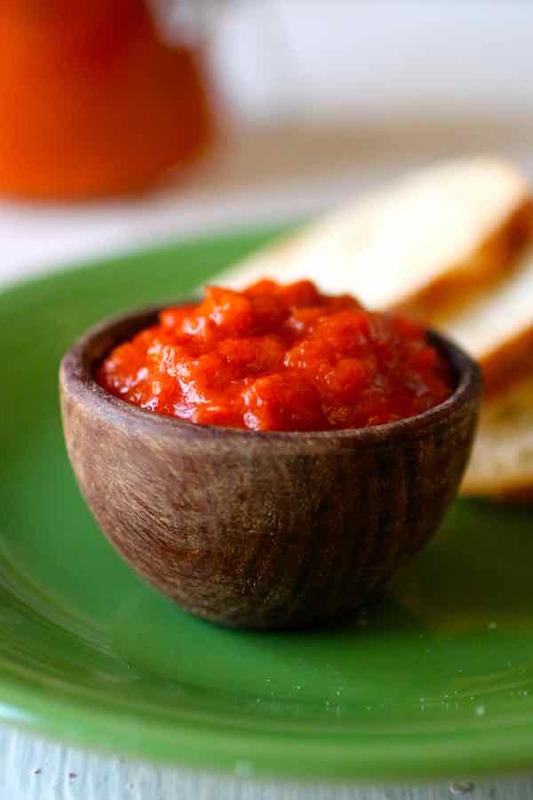 The mashed pulp of ajvar can often be mixed with garlic or vinegar. The most important thing is that the mixture should be stewed for a few hours to ensure that the spread lasts as long as possible once canned. 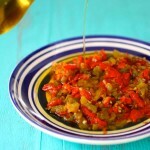 What pepper to use for ajvar? 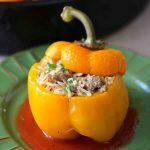 The variety of peppers used for the Balkan spread is bull’s horn sweet peppers. Their name comes from their long, thick and pointy appearance that is reminiscent of a horn. These peppers are known as roge (or roga) in the Balkan region. Elsewhere, they are also known under their Italian name corno di toro (bull’s horn) peppers. They have a thick flesh and relatively easy to peel when roasted. The variety from Macedonia is considered one of the best of the region as the country receives more sunshine which helps those peppers be sweeter. The vibrant spread is common in Albania, Bulgaria, Macedonia, Bosnia, Croatia, and Serbia. 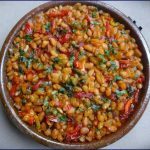 In Serbia, it has been traditionally called “Serbian salad” or “Serbian vegetable caviar”. What is the origin of the word ajvar? The name ajvar actually comes from the Turkish word havyar, which means “salted roe” or “caviar”. Until the 19th century, there was an important local production of caviar on the Danube, as large sturgeons were swimming from the Black Sea up to Belgrade. Ajvar, which meant “caviar”, used to be very popular in the city that is now the capital of Serbia. Because of labor disputes that started in the 1890s, local caviar production decreased. What is the origin of ajvar? Ajvar, as know it today, could have been created by the lower class to imitate the taste and look of caviar, which was very expensive. Commercial production of ajvar started shortly after but the taste of the commercial version is usually quite different from homemade version. Belgrade restaurants also started to offer this red pepper spread as a substitute that became known as “red ajvar” (crveni ajvar) or “Serbian ajvar” (srpski ajvar). However, this spread might have an older history. Indeed, some people claim that the spread was a favorite of Alexander the Great and was an integral part of his meals. What are the different variants of ajvar? Ljutenica (lyutenitsa or lutenica) from Bulgaria, which is prepared with pepper, carrot, eggplant, tomato, onion, garlic, black pepper, vegetable oil, sugar, and salt..
Pindjur from Bosnia and Herzegovina, Bulgaria, Serbia and Macedonia, which is prepared with eggplants, tomatoes, peppers, onion, garlic, black pepper, vegetable oil, sugar and salt. It is very similar to ajvar and the terms are often used interchangeably. Zacuscă from Romania, which is made with eggplant, sautéed onions, tomato paste, and roasted red peppers, to which some add mushrooms, carrots, or celery. Kyopolou from Bulgaria and Turkey, which consists in roasted eggplants and garlic, to which baked bell peppers, tomatoes, onions, parsley, black pepper, and laurel leaves can often be added. Biber salçası from Anatolia (Turkey) is a thick and deep red paste made from red chili peppers or sweet long peppers and salt. 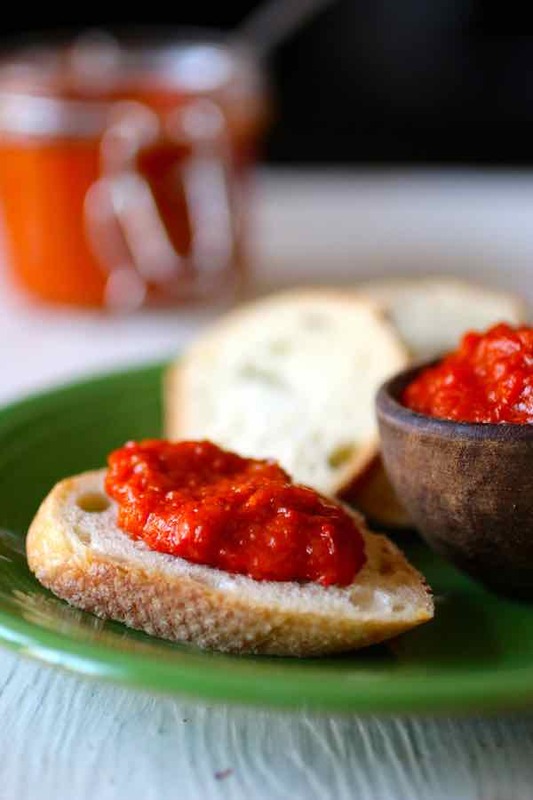 Whether you call it a spread, a side dish, a mezze, a relish, a condiment, or a chutney, ajvar is something you just have to try to make yourself at least once in your life. 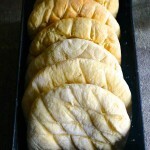 Even though the recipe is not very complex, it can be tedious but can be a weekend project with the family. Trust me, make a big batch, the effort is so worth it! 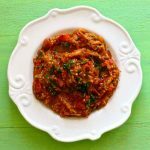 Ajvar is an easy to make and deliciously tangy eggplant and red bell pepper spread that is popular throughout the Balkans. Poke a few holes in the eggplants, and roast them on a grill (ideally) or in the oven until soft and charred, about 30 to 40 minutes. Repeat the same operation with the peppers. Place the eggplants and the peppers in separate bowls, covered with plastic wrap. Let cool for at least 1 hour. Remove all the charred peel and seeds from the peppers and wash them well. Remove the peel of the eggplants with a knife. Place the eggplant, pepper, garlic cloves into a food processor (or a food mill) and pulse a few times until they are finely chopped. Heat the oil in a large pot. Add the mixture and stir with a wooden spoon. Add salt and vinegar. Cook over low to medium heat for at least 2 hours, stirring occasionally so the ajvar doesn’t stick to the bottom of the pan. The end result can be canned, or stored in the fridge and consumed within a week. I nominate Ajvar for the contest. I first had this at Balkanika restaurant in Hell’s Kitchen, NYC, and I have become addicted to it! I haven’t made my own, but I buy it often. I’d like to try this recipe!